Amazing links from Cancun to Akumal, Mexico. Along the Riviera Maya, the sport of golf and the quality of courses available has come a long way in the past 8 years or so. Below you will find a brief description of each course along with operational hours, contact information and web links (where available). All the courses are within close proximity to or on the coast and the biggest factor that comes into play is the wind. It is fairly constant, with the winter months being the windiest of the year. Pay attention to the movement of the treetops in order to gauge your shot direction and club selection. The second factor that a player needs to respect is the dense jungle that lines the fairways. If you like to hit big off the tee, bring extra balls, you'll need them! The greens tend to be fast, so some practice putting before a round is advisable. All these courses have clubs and shoes for rent. They are usually good quality with Taylor Made, Titleist and Callaway clubs seeming to be the most common. Reservations are suggested, especially during the high season, mid December-late April. Common golf etiquette rules apply here, collared shirts, no torn shorts or pants. There are no shoe regulations that we are aware of. In the winter months, having a windbreaker in the bag is advisable as it can get a bit chilly in the late afternoon. All the pro shops sell everything you would expect, but the markups are high, if you are not traveling with your sticks, at least pack some balls and a glove or two. They all employ English speaking locals who can assist you with any questions. Twilight rates are generally offered and start between 1-2 PM. 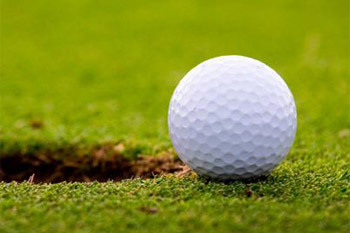 Green fees will vary depending on the time of the year for both daily play and twilight hours. 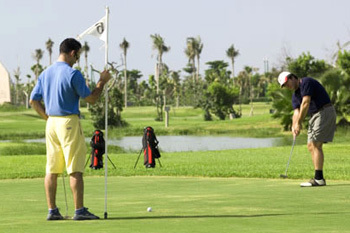 Sol Maya is happy to arrange tee times in advance for its clients, just contact us. 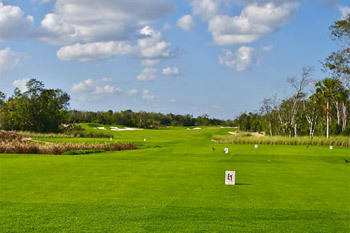 Two Robert Trent Jones II designed courses, an 18-hole and a 9-hole (par 3), as well a driving range and practice area. A spectacular jungle layout that has natural water obstacles and incredible rock formations. Wind can be a factor. Practice balls included with greens fee. 9 hole Par 36 Thomas Lehman designed course. A favorite among locals, this course has tight fairways and soft greens. Nice to walk and play an extra ball or two as it usually not crowded at all. 2 tennis courts for public use as well. 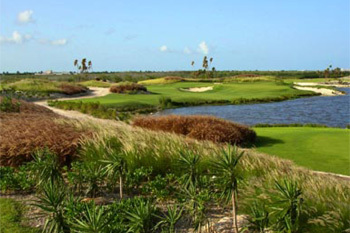 Robert Von Haage designed 18 hole, Par 72 Golf Course built amongst the lush foliage of the Yucatan Peninsula, making this golf course not only beautiful, but extremely challenging as well. Very tight fairways and a number of dog-legs make accuracy a must to insure a low scoring round. Can be all inclusive, depending on the rate. 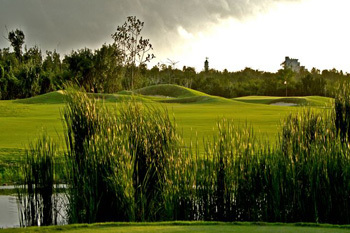 The Grand Coral Golf Club was designed by the legendary Nick Price and is built within the natural jungle of the Riviera Maya. A championship style golf course, 18 hole, par 71 plays 6990 yards from the tips. Deep green paspalum grass is well maintained. Additional amenities for the player; pro shop, driving range, equipment rental, transportation, lockers, safe deposit box, spa, gym, beach club, car bar, snack bar, and restaurant. 18 hole, Par 72 Greg Norman design. 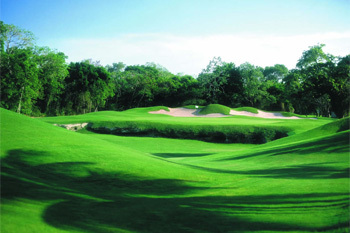 The course is unique in Mexico and extremely challenging. El Camaleon bends through three distinct landscapes - jungle, mangrove swamp and oceanfront - all bisected by massive, limestone canals. 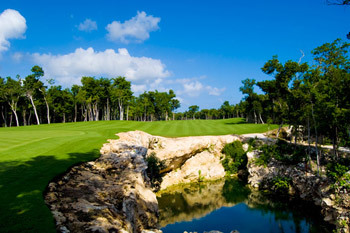 Host to the Mayakoba Classic PGA event each February, this is truly a wonderful course. Excellent practice facility as well. Check with the pro shop for seasonal specials. Par 72, 18 holes, designed by Pete Dye. A very well maintained course and considered one the areas very best. Does not play to long, but you'll need all the clubs in your bag. Fee is all Inclusive, round with cart, food, beverage, liquor and food at the restaurant. 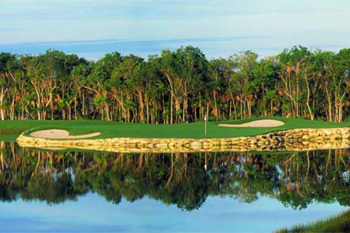 27 holes, The Moon Spa & Golf Club is home to one of the two Jack Nicklaus Signature Design golf courses in Cancun. Each of the three-nine hole courses offers a distinctive environment that challenges professionals and amateurs as well. An 18 hole par 54, that is 2,923 yards long, combines pearly white sand traps, natural stone around its two lakes, and intense color in its greens. 9 Hole, par 3 course that plays quite nicely. 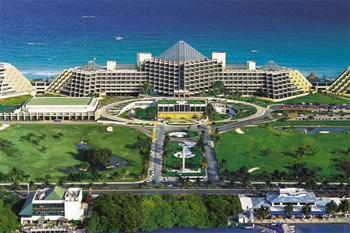 Located at the Paradisus Cancun hotel in Cancun. If you have a late afternoon flight and want to squeeze a quick nine in before heading out, this is a good spot. 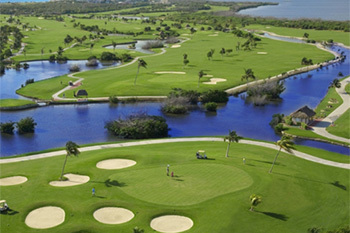 18 hole, par 72 located at the Hilton resort in Cancun. 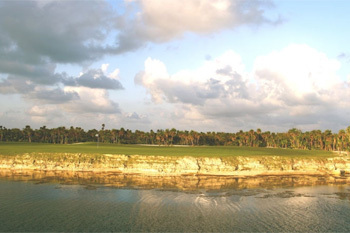 Plenty of water views and Mayan ruins on hole 16 make for an enjoyable round. The first of three 18 hole, par 72 Greg Norman courses. You will appreciate the lush, well-kept grass and impeccable true-rolling greens. The white sandy beaches and traps are a visual and playing triumph. 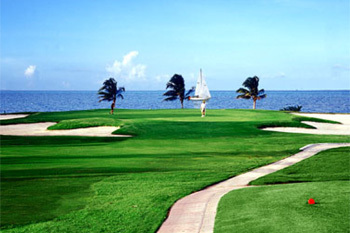 Several of the holes offer spectacular views of the Caribbean Sea and Isla Mujeres. 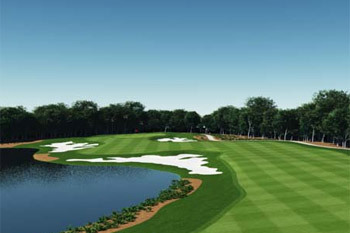 18 hole, par 72 Tom Weiskopf designed course. 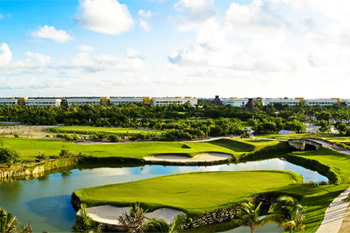 This magnificent Cancun golf course will challenge all kinds of games, short or long, as well as players of all levels from amateurs to pros, with its strategic layout which include narrow fairways, water features, creative green placement and treacherous bunkers. 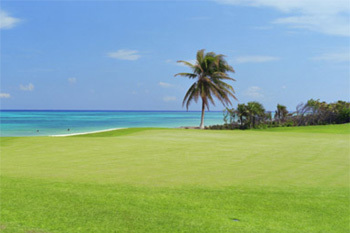 Par 72, 18 hole Designed in 1976 by Robert Trent Jones, Jr. Cancun's oldest, most prestigious golf club, Pok-Ta-Pok artistically incorporates hundreds of meters of dramatic shoreline and ancient Mayan ruins into a truly enjoyable experience for golfers of all abilities. A Jack Nicklaus Signature Course, 18 holes, par 72 and brand new. 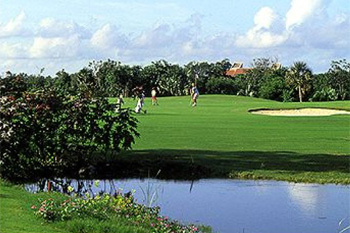 It features strategic bunkering, immaculate greens, stunning layout of fairways, as well as wooden bridges. 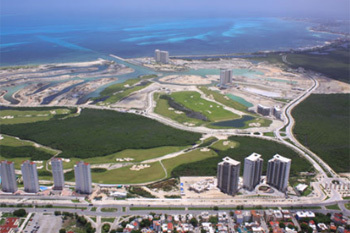 Located at the south end of the hotel zone, this is one of the easier courses to get to in Cancun. On the beautiful island of Cozumel, just 15 minutes from the international pier and 10 minutes from the airport, golfers will find the rustic looking native palapa-style club house. Jack Nicklaus design, 18 hole, par 72. This is another jungle course where wind and errant balls will leave you wishing you chose a safer club time and time again. Plenty of wildlife to cheer you up as you read your scorecard though. If you are staying along the Riviera Maya, you get the added bonus of a ferry ride to and from the island. 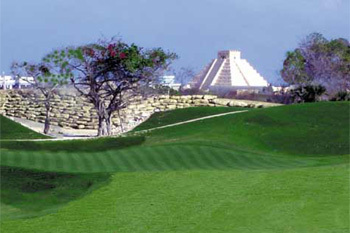 9 hole, par 3 course located at the Oasis Hotel in Cancun. Could be a quick stop on the way to Isla Mujeres for the night, but at only 888 yards, it might not be worth it. 36 holes, 2 courses, Nick Price (La Roca)/Tom Fazio(TPC) design, currently under construction. Located in the hotel zone, we do not have a lot of information to offer on this course.